Today we received Qiu Ju's finding ad. Pictures of abandoned babies are required to be run in the local papers in an attempt to locate birth parents. A man in Utah, Brian Stuy, who has himself adopted three daughters from China, collects the provincial papers and can send adoptive parents a copy of this important part of their daughter's story. This is usually the baby's earliest picture. When we opened the package today, Lyle, Adam, and I first saw a blown up image of just our Qiu Ju, so we didn't have a chance to see if we could pick her out from among the little faces. When Madeline came into the room, we asked her to guess which was Qiu Ju. She looked for all of about 2 seconds and said, "Of course, that's her right there." Can you all pick her out? Well, Madeline was right! Our little Qiu Ju is the third baby over on the top row. Her ad translates to: "Finding date: 9/3/05. Found at the gate of the Guiping City Orphanage. A baby girl. Birth date: 9/2/05 (estimated). We don't know what her name was when she arrived in the orphanage, but her orphanage given name is Jin Qiu Ju." Orphanages are required to run these ads quarterly. This one was dated December 16, 2005. 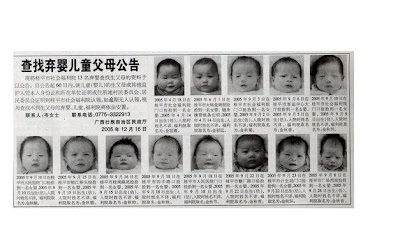 Eleven abandoned baby girls were found in Guiping just in the month of September. It's amazing to think that there are over twenty other orphanages just in the province of Guangxi, all running these ads. China estimates that about 100,000 baby girls are abandoned every year, but other estimates put the number much higher. Seeing these little faces definitely makes it more real. This week we've been concerned with news reports of flooding and landslides in the Guangxi province. Thankfully we haven't heard the city of Guiping mentioned, but neighboring cities have been evacuated and some small villages have been destroyed. Qiu Ju is definitely in our thoughts and prayers and we want so badly to get on a plane to China. There's a slim chance that we might get to go in July, but I'm trying not think about that because I don't want to get too disappointed. I'd be happy with going in August. I just don't want to go when school has already started. This wait has been so much harder than the wait for a referral. Now that we have a name and face, we all feel like time is just creeping along!